We are an authorized Mission Collection retailer. If you have any questions regarding any of Mission Collection products, please visit one of our showrooms or call our customer service. Mission Collection Palacio Castillo Navarre French White Oak. Beautiful French White Oak Castillo parquet flooring, reminiscent of 16th century geometric mosaic wood floors, represents a decorative bridge between Renaissance and modern motif, exquisitely blending natural beauty and warmth into modern day wood floors. The natural grain of the French White Oak is enhanced by subtle wire brushed texture and fuming, creating a naturally aged finish and exquisite colors. From classic herringbone to braided patterns, the rich textures of three dimensional designs work as well in the rustic home as in the most ultra-modern decors. Navarre French White Oak comes with a lifetime structural warranty, a 27 year residential finish warranty, and a 5 year light commercial finish warranty. 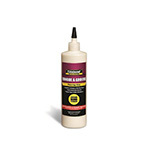 Titebond Tongue & Groove Flooring Glue 16 Fl.Oz. Dimensions 1/2" x 4-3/4" x 23-5/8"
Carton Coverage 18.60 Sq. Ft.